A message from Wild Idaho Rising Tide: During the 2012 Idaho legislative session, a majority of our state senators and representatives succumbed to the mercenary ambitions of the oil and natural gas industry and passed state laws and regulations allowing hydraulic fracturing (“fracking”) and subsequent waste injection wells accommodating oil and gas exploration, production, and transportation in the state. Despite sustained outcry from thousands of citizens and diligent input from scientists, elected officials, and conservation organizations, our delegates have effectively compromised our drinking water, jeopardized our health, undermined local protective ordinances, threatened agricultural communities, endangered tourism revenue, and risked the state’s lands and economy. In response to our policy makers and in conjunction with the Global Frackdown! on Saturday, September 22, concerned citizens and climate justice activists from across Idaho are converging to stage the first public demonstration against looming initial fracking in Idaho. 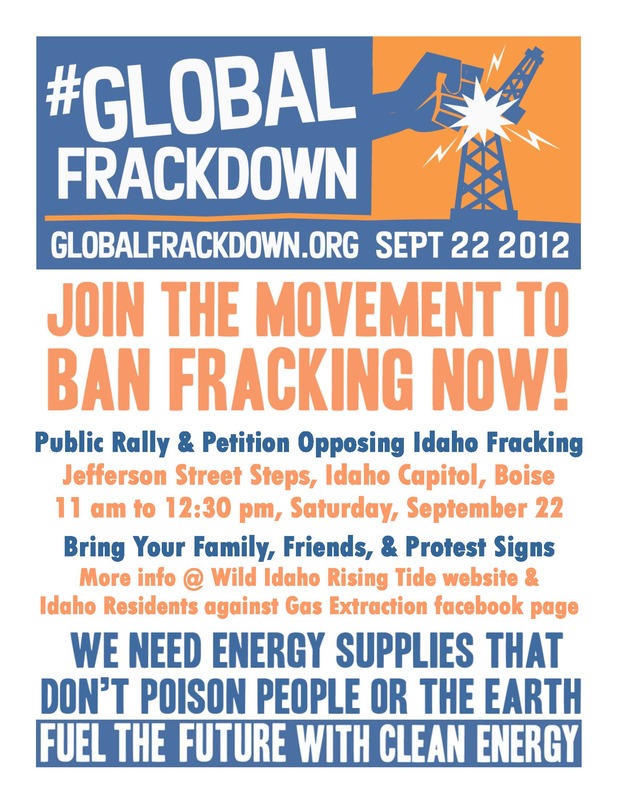 As we craft a ballot measure to ban all toxic oil and gas practices statewide, Wild Idaho Rising Tide, Idaho Residents against Gas Extraction (IRAGE), and other groups and individuals are launching a petition and rally on the Jefferson Street steps of the Idaho Capitol in Boise (700 West Jefferson Street). Join us between 11 am and 12:30 pm with your family and friends and protest signs, banners, and chants. At around 11am, August 11th, over 150 people arrived to block the main truck entrance in and out to the Schumberger Facility, a huge service facility for the fracking industry which covers the entire regional area of drilling providing chemicals, frac sand, truck servicing, and other aspects along with being a coporate headquarters.) . 20 of the 150 came prepared to use their bodies to blockade the facility until they were removed by police. Faced with such large numbers and organized resistance, Schumberger did not have their normal daytime shift. People stayed until 4:30 PM, stopping the daytime operation of this 24/7 hour facility and then left of their own accord, deciding that the action was a success. 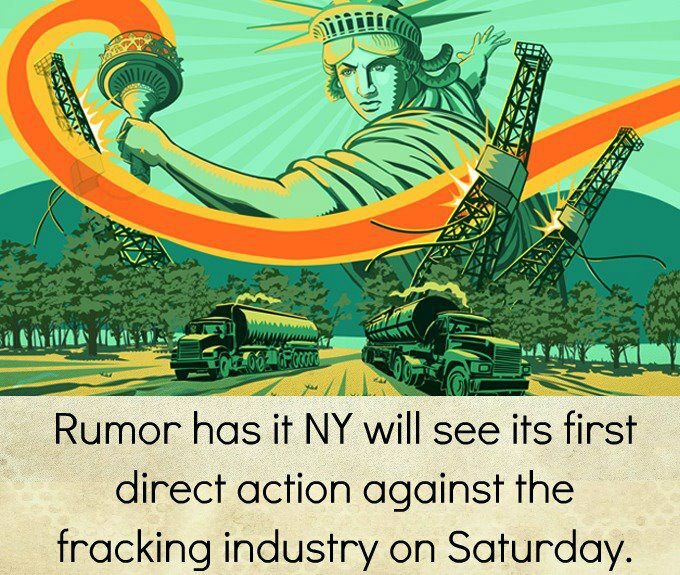 The Shaleshock Direct Action Working Group remains committed to using direct action to confront the presence of a gas industry that is intent on poisoning the land, air and water of our communities. As more people in this movement become interested in peaceful resistance, we intend to continue our work organizing and educating. The Riverdale Mobile Home Park in Jersey Shore, PA is under major threat of eviction due to plans to build a 3 million gallon PER DAY water withdrawal site at the property to service natural gas drilling. Beginning June 1st, Aqua America, a company partnered with Penn Virginia Resources (PVR) wants to begin their work, but first they need to displace over thirty families in the park’s tightly-knit community. Residents of Riverdale, joined by supporters, are blockading access to a mobile home community that is facing imminent displacement at the hands of Aqua America. Aqua America supplies natural gas drillers in the Marcellus Shale region. The blockade was launched to halt Aqua America’s plans to begin construction of a withdrawal facility for water from the Susquehanna River to be used in fracking operations. Aqua America recently purchased the entire Riverdale mobile home unit to be used as a withdrawal site, and has issued lease termination notices to 32 Riverdale families. 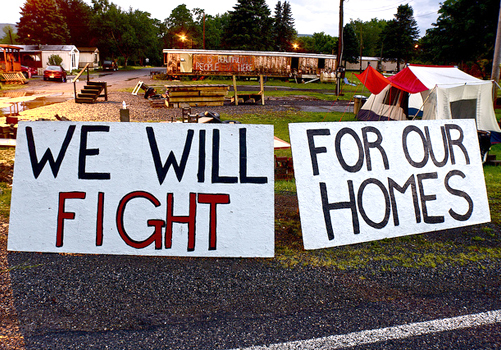 Construction was set to begin on June 1, but supporters of Riverdale mobile home park believe the blockade and protest kept the company from starting the project last week. It is unclear what additional steps Aqua America will take to displace those families who are choosing to remain. Aqua America refuses to sit down and negotiate in good faith despite repeated written attempts by the residents’ representation and advocates. If you are in the vacinity, please lend your support by coming to Riverdale and standing with the residents. Other forms of support can visit the official website: Save Riverdale.